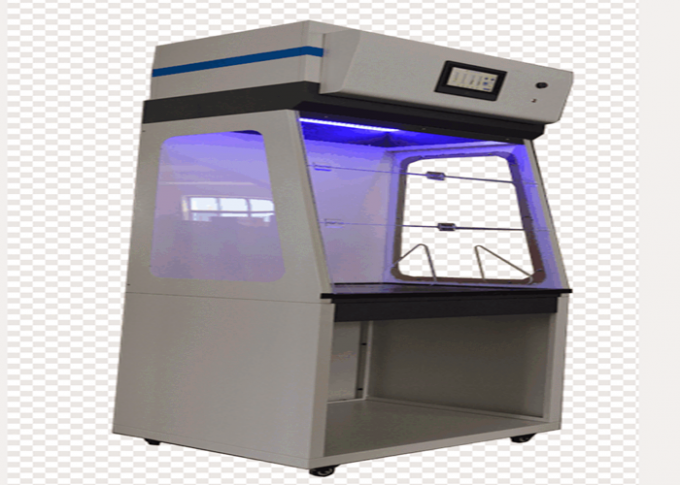 SUCLAB filter fume hood Series conforms to NFX 15211:2009 (certified by ANSI Z 9.5-201), ASHRAE 110:1995 and China National Standard JG/T385:2012, and has passed ISO 9001 certification. The product is designed to protect the safety of laboratory personnel in the operation of the experiment, can avoid the operator in the experiment to inhale some toxic and harmful, pathogenic or toxic unknown chemicals, efficient purification of the ventilator and laboratory air, to provide safety protection for laboratory personnel. 1. Metal parts: galvanized steel plate with main material (> 1.2 mm), epoxy resin electrostatic spraying, coated with durable anti-chemical lead-free coating, maintain high finish and minimize the impact of corrosion and moisture. 2. Front panel and side panel: main material is more than 6mm acrylic board, excellent weather resistance, excellent chemical resistance, not easy to aging, colorless transparent, transparent, visual comfort, beautiful and generous. *3, seven inch LCD touch screen display, HD display resolution 1024*600, perfect vision system. * 4. Real-time temperature and humidity environment monitoring system, displaying temperature and humidity, setting alarm parameters to ensure the safety of products. * 5. Fan monitoring: Fan system failure alarm, on-line adjustable fan speed, to ensure that different chemicals operating requirements of air volume. * 6. Filter saturation alarm system: the filter set a saturation alarm value, beyond the scope of the alarm, corresponding to VOC concentration level, when the alarm and concentration level at the same time in a high position to replace the filter. 7, the United States imports PSC fan, 24 volt voltage, stable performance, super quiet, no spark static. 8. High-efficiency filtration system, according to the size of particles selected distribution, follow the ASTM standard, effective for acid gas and organic gas, adsorption capacity is strong, for particles using high-efficiency HEPA filter, for particles larger than 0.3um, filtration efficiency of 99.995%. 9. LED lighting power equivalent to 25W fluorescent lamp, does not produce heat, safety does not affect the experimental environment temperature, energy-saving, environmental protection, long life. 10. Epoxy resin table top has superior chemical stability, super corrosion resistance, good impact resistance without damage, excellent high temperature resistance, integrated core penetration, long service life, no delamination, no expansion, no cracking. 1, no need to install pipeline engineering, convenient installation, exhaust emissions, new environmental protection. 2, the top can be selected according to the experimental needs of the filter module system, to meet a variety of different experiments. 3. Advanced modular filtration technology absorbs harmful gases and particulate dust produced in the filtration experiment. 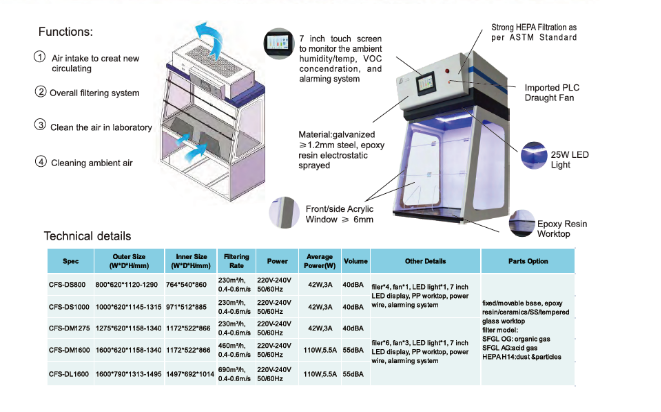 4, no need to consume air conditioning energy consumption, high efficiency and energy saving. 5. 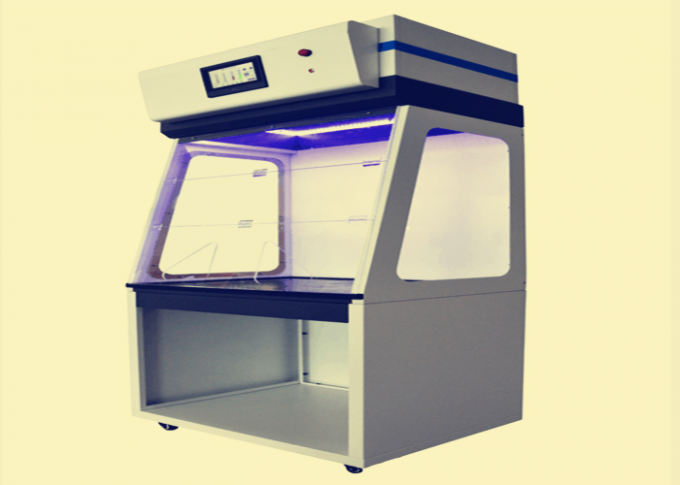 It can be placed on the desktop or equipped with a mobile wheel seat, which is convenient and flexible, and is suitable for any complex experimental site. Air can be pumped directly from the laboratory into the fume hood, forming a negative pressure, and a stable surface wind speed forms a natural barrier to isolate users and the chemicals they operate. The fan system inhales toxic and harmful gases and filters back into clean air. The excellent control concentration of the cabinet ensures that the chemical gas in the cabinet does not return to the room, causing pollution. According to different operation, different filters are equipped to effectively filter toxic and harmful gases, purify laboratory air, remove chemical residues and odors, and improve laboratory cleanliness. l. Cost-saving. It is a DUCTLESS fume hood. For those laboratories with a need for adding a fume hood but without a reserved ventilation pipes, this ductless fume hood is undoubtedly the best choice. l. Environmentally friendly & energy saving. It’s equipped with an advanced filtration system. With the help of the Fan, the polluted air will go through the filter where toxic chemicals would be purified, becoming clean and safety air back to the laboratory. 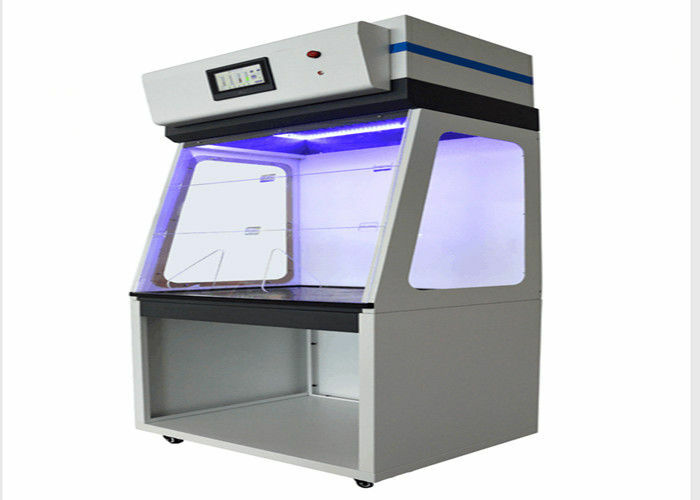 Compared to traditional duct fume hood, it will not consume any expensive air-conditioning wind, and also the polluted air will not be directly exhausted to the outside, harming ambient environment and people. l. Easy to be installed.The modular design of the fume hood itself allows for being assembled within one hour.